How Can I Teach My Son to Read….When He Won’t Sit Still?! You are here: Suzy Homeschooler » Literacy, Physical Fitness » How Can I Teach My Son to Read….When He Won’t Sit Still?! My greatest struggle in teaching my son is, and has always been, he learns differently than I did as a child. I read about the different learning styles and gather ideas from other homeschooling blogs and in my head it all makes sense. He needs to move around to learn, he needs the physical connection with his environment. Its really so simple. But applying this knowledge is like trying to speak French to a Frenchman without any experience in speaking French! My son is, in his own way, speaking a language which is foreign to me. I have had no practice in kinesthetic learning. I was the little girl who curled up with a good book and read for HOURS quietly to myself. LittleMan is nothing like that! He sits and listens to us read to him for a little while. However, as soon as there’s a pause in the story, he’s up pretending to be Hiccup sailing the Hopeful Puffin off on another quest or he’s up pretending to be Bruce Banner transforming into the Hulk. He would rather act out the story than listen to the story. And thats ok! I just need to work harder to teach him in ways that he’ll want to learn and in ways be able to absorb the information he’s offered. One idea I came across [pictured above and below] seems to be right up his alley. I found the idea at Simply 2nd Resources. 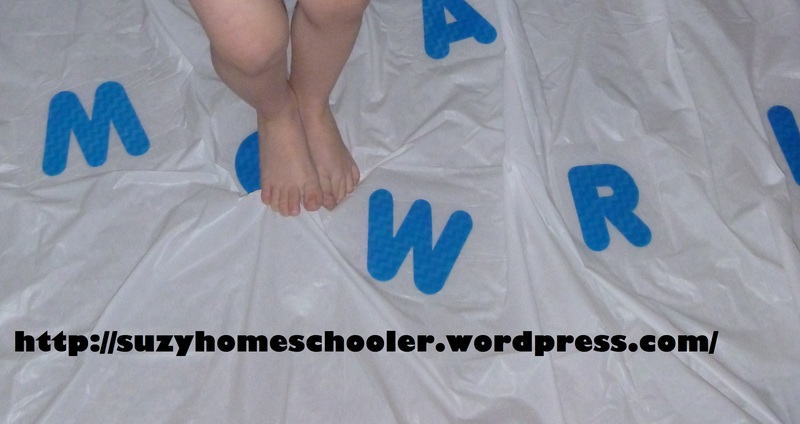 The original idea involves taping page protectors to the back of a clear shower curtain and slipping pages with large letters on them into the page protectors. Because its not permanent, it can be switched out between lower case, upper case, script, numbers, shapes, etc… I didn’t have a clear shower curtain on hand so I made do with what I had. My version is simply some paper letters I already had on hand, randomly taped onto a white shower curtain with clear packaging tape. Mine is permanent; unlike the original idea, I can’t change my letters out. 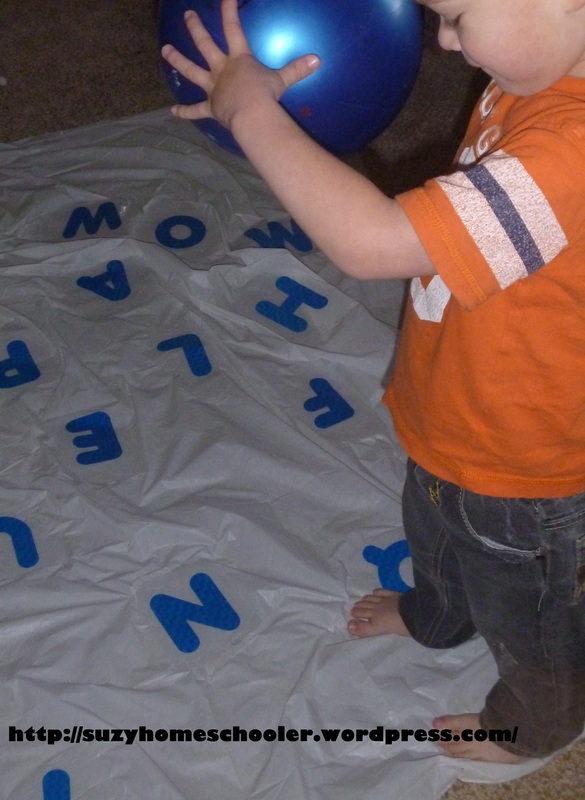 Sometimes instead of jumping from letter to letter, he prefers to bounce a ball on the letter. I’m always on the lookout for more gross motor activities that incorporate phonics and basic maths. If you have any suggestions, please link them up in the comments section. I’d love to hear from you! For more literacy activities and lessons, check out our Literacy Pinterest board! Follow Caitlyn Stock (Suzy Homeschooler)’s board Literacy and Writing on Pinterest. 2 Comments to How Can I Teach My Son to Read….When He Won’t Sit Still?! Looks like you have some wonderful ideas to combine movement with learning. Every child benefits from this approach. Research also indicates that children who move more during the school day perform better academically. If you need more suggestions, check out our freebie page under the gross motor and video activity ideas section – http://yourtherapysource.com/freestuff.html. Wow! That is a really awesome resource, thank you for sharing! So many fun ideas I don’t even know where to begin.